The Affordable Care Act (President Obama’s signature legislation) has increased the tax burden on taxpayers and companies, a fact ignored in recent broadcast news reports. Obamacare created or hiked at least 13 taxes, Forbes reported Feb. 17. Forbes contributor and tax lawyer Robert Wood said that for the average American, “it’s easy to be overwhelmed” by all the new taxes and forms that come with Obamacare. 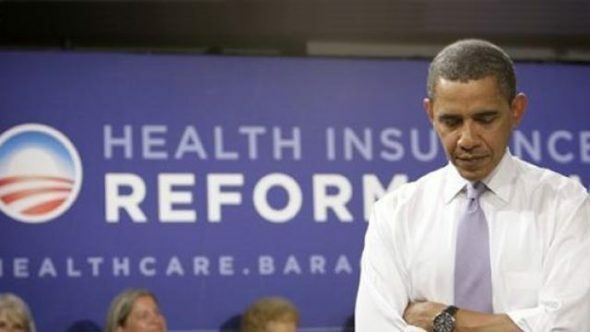 In addition to three new IRS forms, Wood wrote that Obamacare taxes included a 40 percent excise tax on high-end “Cadillac” plans, a $63 fee on all plans to help insurance companies cover “the costs of high-risk pools,” and a “tax penalty” of $95 or 1 percent of income per adult without health insurance up to $285 per family for 2014. But the morning and evening news shows of ABC, CBS and NBC failed to mention Obamacare would raise taxes at all in 87 percent of stories and news briefs that mentioned both healthcare and taxes between Nov. 17, 2014 and Feb. 17, 2015. Washington Post reporter Jason Millman wrote on Feb. 17, that the tax penalty for not having insurance will increase to $325 or 2 percent of income per person for the 2015 tax year, and that “it’s likely that a lot of people who will have to pay don’t know it yet.” Millman said that most people will not find out they owe this money until they file their taxes, after it is too late to do anything to avoid the penalty. The networks’ failure to properly inform viewers about the many taxes in Obamacare may be part of the reason so many taxpayers will be left in the dark. During a story about President Barack Obama’s State of the Union address, co-host Natalie Morales highlighted President Barack Obama’s plans were “designed to help the middle class” during NBC’s “Today” Jan. 21. Morales described how Obama proposed “paid sick leave, free community college and tax hikes on the wealthy” during his State of the Union address. In that same report, Morales said that Congressional Republicans would oppose Obama and “fight to repeal and replace President Obama’s healthcare law.” But Morales failed to note that Obamacare would cost middle-class taxpayers billions of dollars, the very Americans Obama said he wanted to help, and that Republicans’ plan would eliminate significant taxes for this group. Even when the networks pointed out tax increases resulting from Obamacare, they failed to describe the problem in detail. The networks only mentioned a specific tax in two out of 23 stories and news briefs. Those two mentions were news briefs on CBS “This Morning” Feb. 15 and NBC’s “Today” Nov. 19, 2014, said that Americans without health insurance would have to pay a tax penalty. No other specific tax connected to Obamacare was mentioned by any of the networks during that time. Methodology: MRC Business examined the stories during morning and evening news shows on ABC, CBS, and NBC from Nov. 10, 2014, through Feb. 17, 2015 that mentioned “tax” or “taxes” and “Obamacare,” “healthcare,” or “health care.” Of the 23 resulting stories, only three mentioned taxes associated with Obamacare. 1. What type of bias does the excerpt illustrate? 2. Joseph Rossell writes: "The networks’ failure to properly inform viewers about the many taxes in Obamacare may be part of the reason so many taxpayers will be left in the dark." b) Do you think it doesn't matter if the networks chose not to report this (because most people get their news from the internet and probably saw this information on a news website)? Explain your answer. 3. Do you think NBC, ABC and CBS purposely chose to ignore these facts that Forbes and the Washington Post reported? Explain your answer.